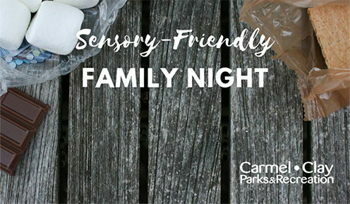 Carmel Clay Parks and Recreation invite you to Join them for some outdoor family fun, inside! Families can roast hot dogs and make the perfect s'mores on the patio! Enjoy fun lawn games, board games, and puzzles or choose to "camp-out" inside while watching a sensory-friendly movie. Families can choose to bring blankets, pillows, or sleeping bags to make the movie more cozy. Price ($15) is per family. One registration will include the entire family. *Designed for individuals with disabilities.